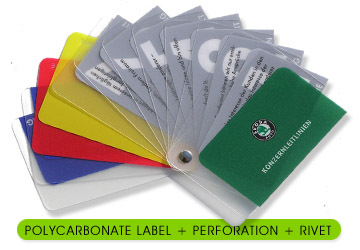 We produce polycarbonate labels in various shapes. We are able to produce the full-colour transitions too. 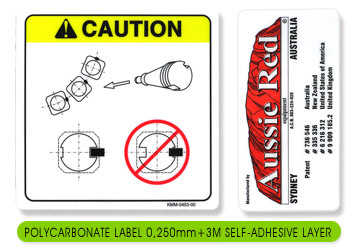 The advantage of these labels is that the mirror image is printed from the reverse side on polycarbonate foil and finally is overprinted with the desired colour. 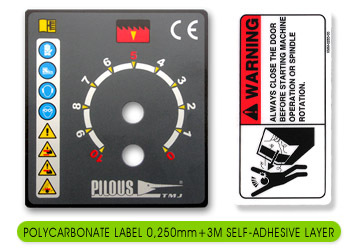 After that the printing is protected from the labels´ front side from the abrasion and the effect of external impacts. The labels are very resistant. 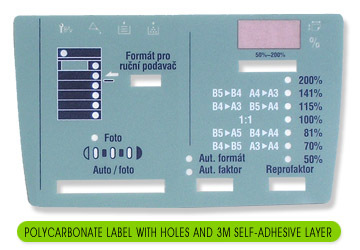 Thus printed labels can be protected from the reverse side with self-adhesive layer - then the self-adhesive label can be placed onto desired place. We produce for you consoles, various labels, business cards, floor advertisement etc. Do not hesitate to contact us!